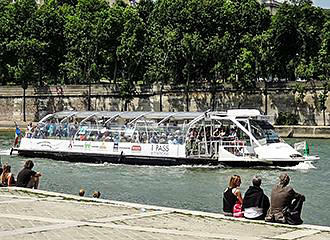 Yet these water buses in Paris do not zig-zag across the river, you just have to wait until the Batobus reaches the stop you want on its circuit, but to follow is a taste of just some of the tourist attractions, monuments and landmarks in Paris that you could discover within walking distance of the Batobus stops. At The Hotel de Ville stop, which is also known as the City Hall Batobus stop, you will be able to discover old houses looking out onto cobbled streets from days gone by, within the Saint-Paul and saint-Gervais areas along with the Hotel de Ville. Also located within the 4th Arrondissement of Paris in the Marais district you will be able to discover the Pompidou Centre, which is also known as the Beaubourg and holds the Musee National d’Art Moderne. Then there is the Musee Picasso, the Musee de la Poupee, and the lively Jewish quarter with many different boutiques and eclectic bars along with the Musee d’Art et d’Histoire du Judaisme. 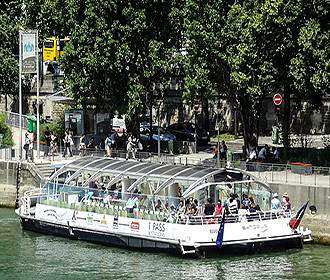 To reach the Batobus water bus from this area, when you are in the Place de l'Hôtel de Ville, you would take the pedestrian underpass to the Quai de l'Hôtel de Ville, and then walk upstream along the quay for around 100m, where you will find the stop right in the square. 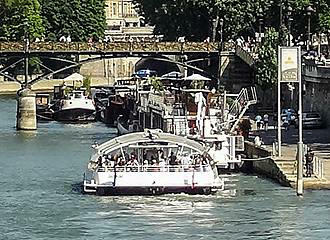 Located in the 1st Arrondissement of Paris, back in the early part of the 1800s, the port at The Louvre saw the arrival of the first steamboat called the Elise, which was watched by hundreds of people. Yet today, it is this area that has become more popular because of visiting the most famous museum in Paris and the most well renowned art museum in the world called the Musee du Louvre. However, there are also many other museums located nearby, such as the Musee des Arts Decoratifs, the l’Orangerie and the Jeu de Paume, along with landmarks in Paris like the Tuileries Gardens themselves and the cafes located within the gardens for a relaxing snack. Plus there is the Arc de Triomphe du Carrousel, which is one of the monuments in Paris that was constructed for Napoleon Bonaparte I, along with many luxury boutiques, and antique shops to browse. The Quai du Louvre is located between the Pont Royal and the Pont du Carrousel bridges, and if you think about walking from the Musee du Louvre towards the quays on the River Seine, you would then turn right and walk for around 100m, which is just before you would cross the Pont du Carrousel. And it is here that you will find the steps that lead down to the Batobus stop on the quay. The most famous Avenue in the World, is the Champs Elysees, which translates to Elysian Fields in Greek, and is one of the well known tourist attractions and landmarks in Paris that has a rich history and is a beautiful tree lined avenue. The Avenue des Champs Elysees runs from the Place de la Concorde with the Luxor Obelisk, up to the Place Charles de Gaulle with the fabulous Arc de Triomphe, which was the triumphal arch commissioned by Napoleon Bonaparte I and now home to the Tomb of the Unknown Soldier with its eternal flame along with a museum on the history of the Arc de Triomphe. This avenue has become a place to shop, eat out in Paris and one of the most visited streets in Paris, and yet it is also the setting for major street parades, military parades and ceremonies, like those related to the French revolution on the French National Holiday of 14th July each year. Disembarking at the Champs Elysees stop, you could also visit the Avenue Montaigne that is home to numerous high-end boutiques such Louis Vuitton, Dior, Chanel, Dolce and Gabanna, along with the fabulous Plaza Athenee hotel. Plus you could visit the Grand Palais, or the Petit Palais that is home to the Muse des Beaux Arts de la Ville. Located in the 8th Arrondissement of Paris close to the Pont Alexandre III bridge, if you are coming from the Place Clemenceau, you would need to take the Avenue Winston Churchill heading towards the River Seine. Then you would make your way down stairs, which are situated to the left of the Pont Alexandre III in order to find this particular Batobus stop. The most famous of all landmarks in France is of course the Eiffel Tower, which is opposite the Trocadero Gardens, and the Champs de Mars that was the former military drill ground at the foot of this tower with its incredible illuminations. However, a good view point is from the Palais de Trocadero, yet there are also several museums within easy reach of the Batobus stop including the Musee du Quai Branly, the Musee Nationale de la Marine, the Cite de l’Architecture et du Patriomoine and the Musee du Vin. Plus you have the unusual Paris sewers museum called the Musee des Egouts along with the incredible CineAqua aquarium for something entirely different. Located in the 7th Arrondissement of Paris, the Port de la Bourdonnais is at the foot of the Eiffel Tower opposite the Trocadero Gardens, so you just need to cross the street and walk down the stairs at the right hand corner of the Pont de Iena. This Batobus stop is just by an old railway station, and when you look at the history of the Musee d’Orsay, you will find that this area of Paris was originally an upmarket and aristocratic neighbourhood, yet the old railway station was eventually used for many purposes other than as a railway station, and in time it was turned into the Musee d’Orsay Museum in Paris that starts its impressive collections from where the Louvre museum stops. This is one of the secretive areas of Paris, where you can admire many fabulous old mansions, but many of these are now utilised by Foreign Embassies and diplomats, yet there is much more to this area that just the Musee d’Orsay. You can also visit the Musee Rodin, the Musee de l’Armee along with two other museums and the Tomb of Napoleon at Les Invalides, plus the Musee Maillol. However, if you cross the River Seine in the opposite direction, there is the Tuileries Gardens right opposite along with the Musee d ‘Orangerie, the Arc de Triomphe du Carrousel and the famous Louvre museum. 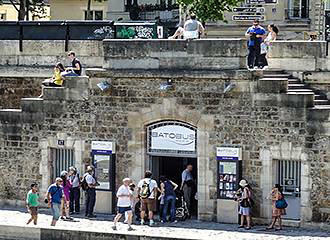 To access the Batobus stop from the Musee d’Orsay, as you leave this museum, then you would cross the street along the quays, then go down the steps to the river bank and here you will find the Quai de Solferino in the 7th Arrondissement. The abbots were the first people to settle in this area of Paris and they brought with them money and knowledge and then the Academie Francaise or French academy for literature, art, etc was formed along with the Ecole des Beaux Arts art school. Therefore Saint-Germain-des-Pres has always been regarded as a place for literature, art and philosophy and there are numerous bookshops and galleries. However, there is much more to this popular area of Paris, such as the old apartment and studio of an artist, called the Musee Eugene Delacroix, the Saint Sulpice church, the Musee Cluny, which is also known as the Musee du Moyen-Age, many different historic quays and the oldest called the Quai des Grands-Augustins dates back to the early 1300s. 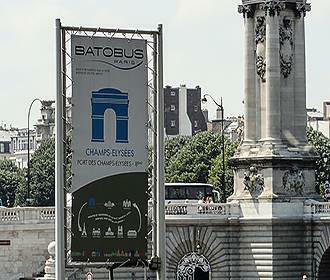 The Batobuses stop at the Quai Malaquais, which is close to the Institute de France in the 6th Arrondissement of Paris and by following the Rue Bonaparte you will reach the quay, and you just have to cross the road and go down the steps to the river bank in order to access this particular stop. The Ile de la Cite is the very heart of Paris and is an island in the middle of the River Seine, which is where Paris was first founded and the original name was Lutitia. It became the official kings residence and La Conciergerie, which was a palace, that was then turned into a prison where Marie Antoinette was held, is just one of the places you can visit. Just along the River Seine there was a port that once brought the firewood to the city and even today, the Ile de la Cite can only be reached either by boat, or one of the bridges like the Pont Neuf, which is actually the oldest bridge across the River Seine. However, on this island there is also much more to see such as the Saint Chapelle chapel and the impressive Notre Dame Cathedral, which is also known as the Notre Dame de Paris. 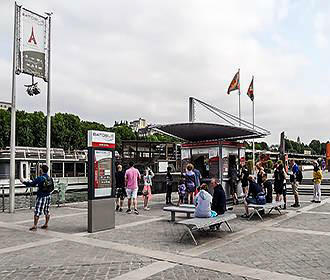 The Batobus stop itself is on the opposite bank to the Ile de la Cite and the Notre Dame Cathedral in the Latin Quarter of the 5th Arrondissement of Paris and the nearest bridge to access the monuments in Paris is called the Pont au Double. 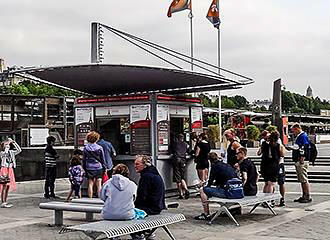 So, to access the Batobus stop, you would need to go to the Quai de Montebello and walk around 100m upstream from the Pont au Double, then take the stairs down to the river and the quay. Incredibly, this stop used to be a beach for people to wash in until bathing in the River Seine was forbidden and the first baths were opened towards the end of the 1600s. Since then, the area has been home to many warehouse and there were trade ports constructed plus there was a a large herb garden constructed and then a natural history museum was starting to get established. Today, you can still get to see the botanical gardens of the Jardin des Plantes along with four museums and a small zoo and nearby is the Grande Mosque and the Institut du Monde Arab, along with the Musee de la Sculpture en Plein Air open air sculpture museum. 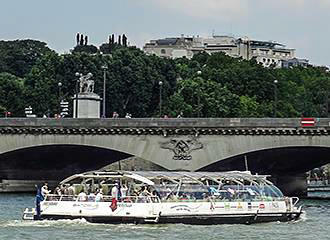 The Batobus water bus service then stops at the Quai Saint-Bernard, which is located in the 5 Arrondissement of Paris between the Pont Sully and the Pont d’Austerlitz, which is also where the open air sculpture museum is located. You would need to take Rue des Fosses-Saint-Bernard towards the River Seine, then cross Quai Saint-Bernard, which is in front of the Institut du Monde Arabe and go down to the river via the ramp or the stairs. From there you would need to walk upstream towards Pont d'Austerlitz and through the Jardin Tino Rossi, which is the beautiful open air sculpture garden. So as you can imagine with all these different stops this form of transport in Paris has also become very popular with the locals, as well as a great way for visitors or tourists looking at seeing this remarkable city in a more relaxed way. 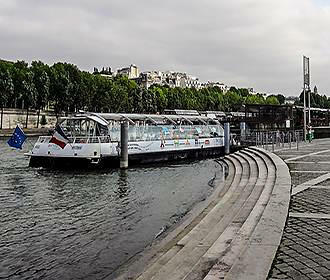 The Batobus is a water bus, which is a very different kind of transport in Paris and is designed to enable people that are on holiday in Paris to reach many of the monuments, landmarks and different tourist attractions in Paris. 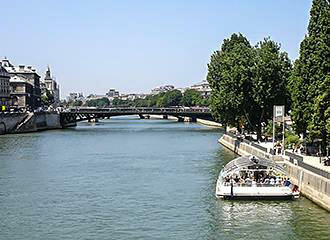 There are actually five stops on the Left bank of the River Seine, which in order as you go round are the Effel Tower, the Musee d’Orsay, the Saint-Germain-de-Pres area, Notre Dame Cathedral and then the Jardin des Plantes. In addition to these there are also three stops on the Right Bank of the River seine, which are the Hotel de Ville, the Louvre Museum and the Champs Elysees Avenue, before the glass covered boats go back round the most famous monument in Paris, which is of course the Eiffel tower.